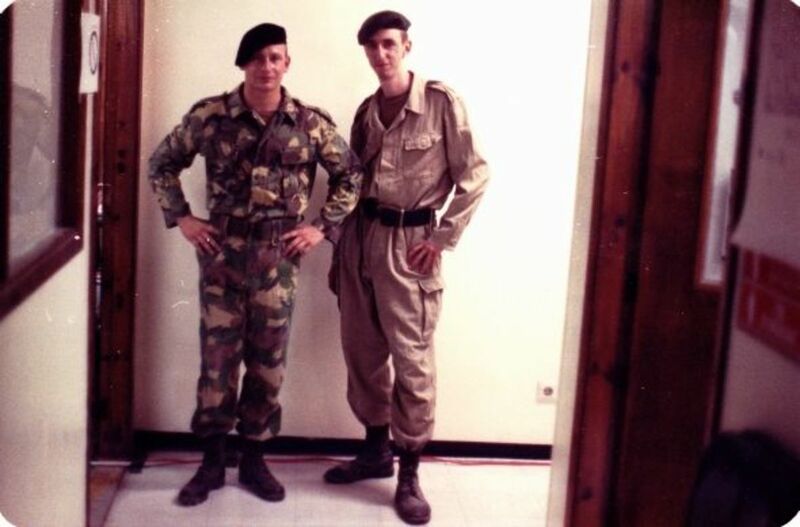 My Desert Shield & Desert Storm Photo Album - Join Me in this Journey! It is hard to believe that the first Gulf War, Operation Desert Shield & Operation Desert Storm, is already 23 years old. I was there and it still feels like yesterday. Please join me in my journey, with original photographs, of my experiences there. Although I have many stories to tell, this website will focus on my photographic journey. I hope you enjoy and please feel free to leave me some comments below! Hoo-Ahh! This won "Lens of the Day" on December 5, 2011. Thank you Squidoo Staff for this great honor! Someone sent me a cassette of this song during Desert Shield, yes, remember cassettes? It still brings a tear to my eyes! There are many websites and information out there that explain this war. I would prefer to tell you in my own words. The following photos describe my journey but you do need a little background. 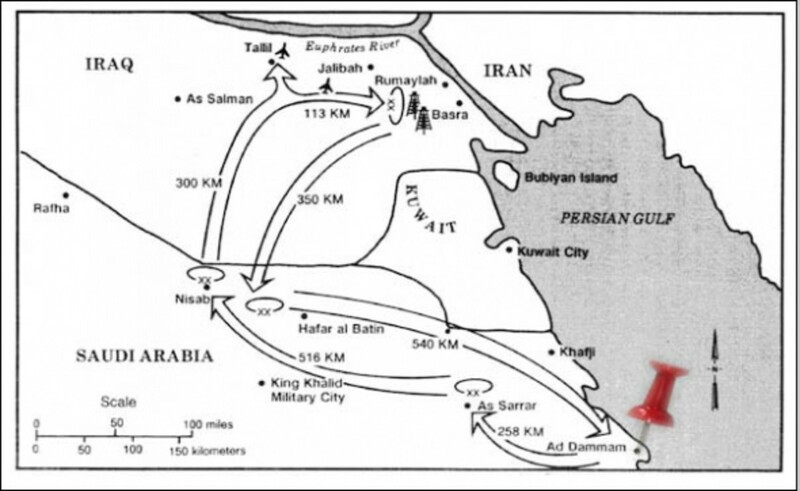 Operation Desert Shield started in reaction to the Iraqi invasion of Kuwait. The Iraqis felt that the Kuwaitis did not own the regions of oil that they were drilling. There was a lot of speculation about "slant drilling" and other encroachments that could excuse the Iraqi claims, however, nothing excuses the invasion of another country and the war crimes that were committed against those people. 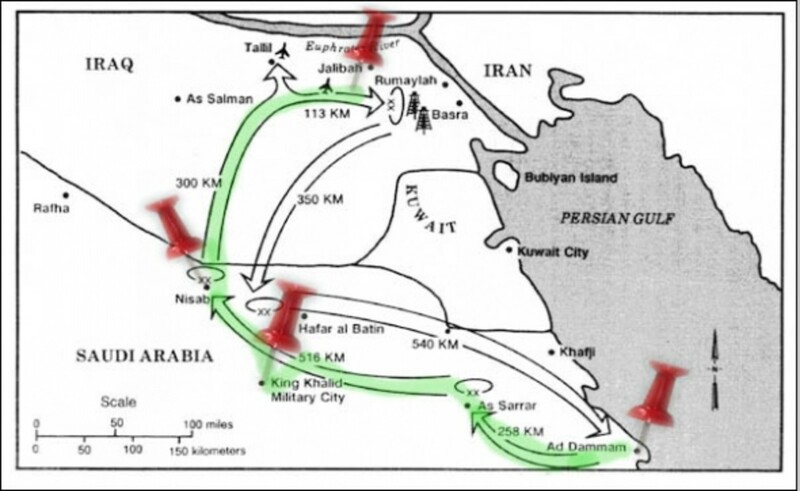 Saddam Hussein chose to go this route instead of some other type of negotiation. This was not acceptable to the United States and other Nato countries. President George H.W. Bush authorized troop movement and military buildup in the Middle East in early August of 2009 to try to force the Iraqis out of Kuwait. While the buildup did not intimidate Hussein, it actually increased hostilities. This troop buildup was called "Operation Desert Shield." In January of 1991, Saddam Hussein did not relent and the AIr War Phase of Operation Desert Storm began. This lasted for 6 weeks and finally, the ground war phase of Operation Desert Storm began. 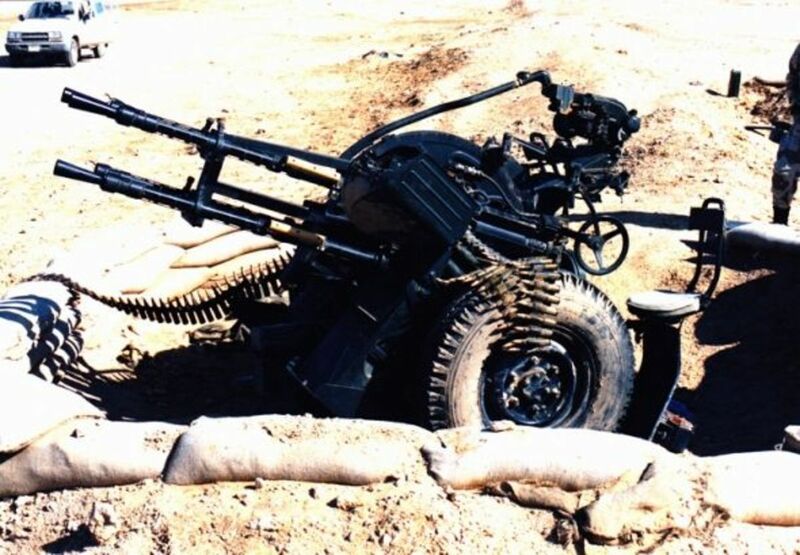 The Air War had all but wiped out the Iraqui Army but there was still some resistance from the tough Republican Guard Divisions of the Iraqi Army. 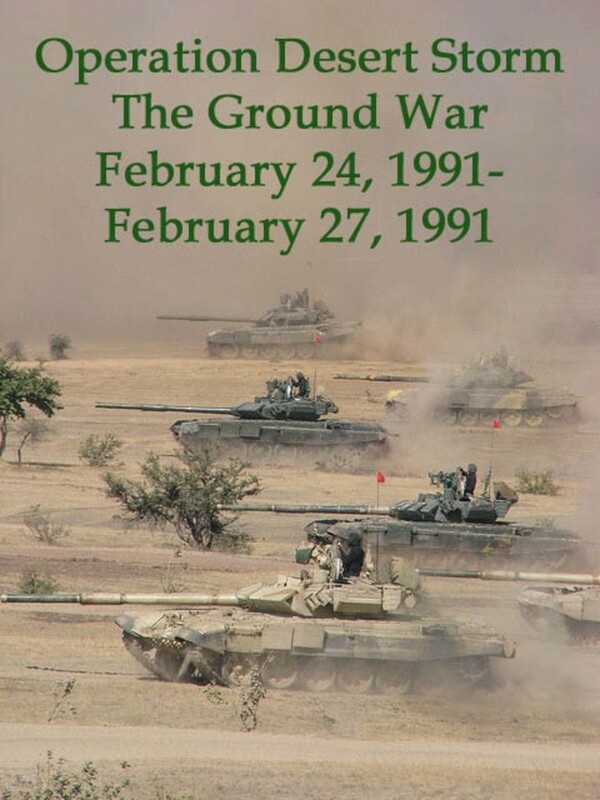 The Ground War offensive only lasted one week and the war was virtually over...although Saddam Hussein continued with his terror leading up to the second Gulf War...and now you know the rest of the story! Operation Desert Shield - How the People saw it! This map is actually an operational overview of the 24th Infantry Division (Mechanized) in Operations Desert Shield and Desert Storm. Our unit, the 20th Engineer Brigade went on basically the same path as they did, in support of the 5th Division. I will be putting pushpins on these maps to show where I am and will go in sequence of my movement. We actually didn't have to build an encampment, our base camp was in an old abandoned factory warehouse. The administrative offices served as our operations center and we slept in the warehouse. 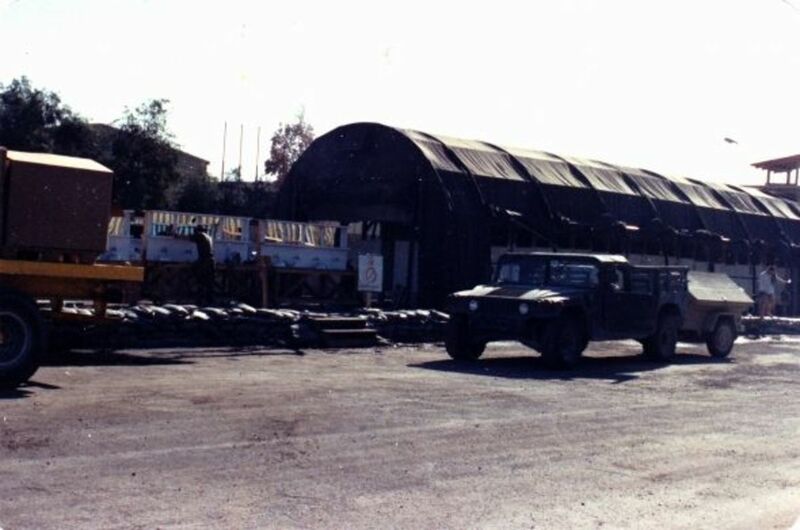 The barracks warehouse had a blockade in front of it to prevent a car bomb from entering the sleeping area, although we had a guard post, gate and outside perimeter fence to keep out the outsiders. We performed all functions in this camp although we did get to go outside. This was a several month waiting period during the buildup so we had to keep occupied. We listened to a lot of music and also read and wrote. I had a Nintendo Game Boy which helped during off time. In this photo, you can see our makeshift sinks and mirrors...gotta look good! In this photo, you can see our makeshift toilet structures to the right. These were like wooden outhouses with several holes, so you can have someone to keep you company. Unfortunately, the flies were so bad that it was hard to keep them off of you. As you can see, the makeshift tents are very eclectic! ha! Each soldier had a cot and you created your home to your own taste. Everyone needed a mosquito net that helped keep out the mosquitoes and flies out. Unfortunately, they always found a way in anyway. There were so many flies that they would stick to you and you got so used to them, that you didn't even notice. Reds Win the World Series in 1990 - Dedicated to Us! My hometown team, the Cincinnati Reds won the World Series. Although we heard some of it on the radio, we didn't hear the end of it. My mother sent me a copy of it via VHS video tape. Yes, remember the VHS? haha! My cot (to the left). Sorry I didn't make my bed before taking my photo. My trusty M-16 leaning up against my lock box. Had to protect those valuables and especially that Game Boy! I had my chemical mask strapped on and we always had to have it strapped to us at all times and have easy access to our chemical gear in case Sadaam decided to launch some nasty stuff into our camp! No, I am not related to Hitler and no, my hair has not been that short for a long long time! Operation Desert Storm Merchandise - Show Your Support! Since I was part of the Intelligence section, we had to familiarize others with the enemy. These are 2 American soldiers in captured Iraqi uniforms that I used as props before my briefing. It was difficult to find appropriate models, the Iraqis were very skinny. This is the bridge from Saudi Arabia to the country of Bahrain. I got to make a trip there to get maps from the warehouse which we had there. Very few had this opportunity and I took a photo to commemorate it. I remember that alcohol was banned in Saudi Arabia and many Saudis went to Bahrain, just to drink. I did enjoy a beer even though it was very poor in taste, it tasted good to me. Bahrain was also where the Naval hospital ships of Mercy and Comfort were docked. A lot of very cute nurses! 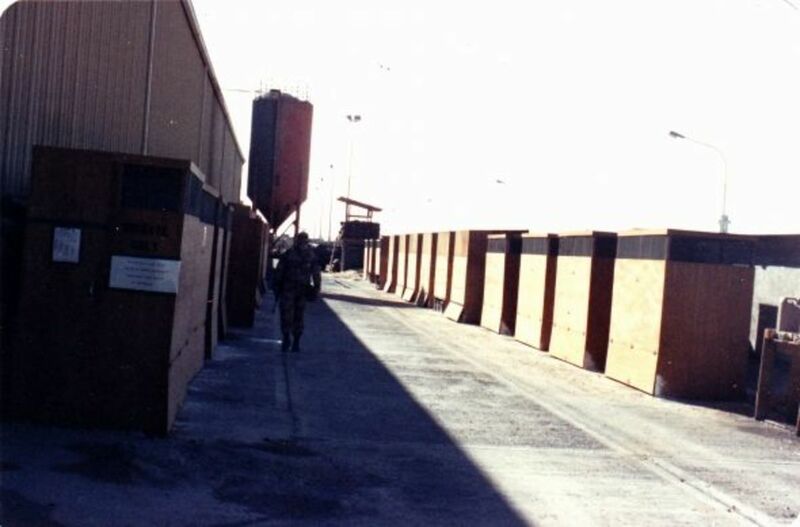 Around the end of 1990, I was shipped off to King Khalid Military City (KKMC) which was a staging area for our unit prior to the Air Campaign. Our Staff Sergeant was injured and I took his place. At this location, I started briefing the Colonels on all military intelligence matters including locations of enemy units. 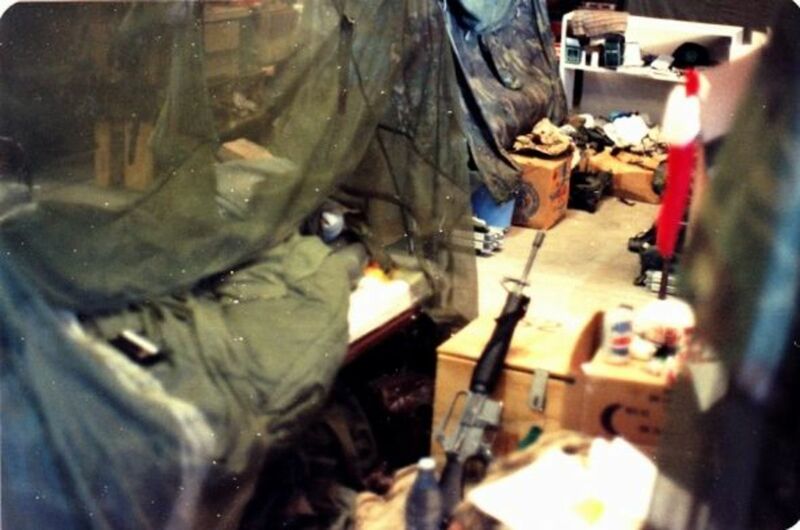 A few weeks after my arrival, in the early morning hours of January 17, 1991, we were awoken and sent out to foxholes in full gear. We watched the planes take off from KKMC in the first phase of the air war. While many in the USA were watching this on television, I was in a foxhole in the freezing rain. Sortie after sortie took off and I still have this very vivid in my memories. The Coalition Forces buried dumpsters along the Iraq border to lead the Iraqi radar into thinking there were actually tanks there. 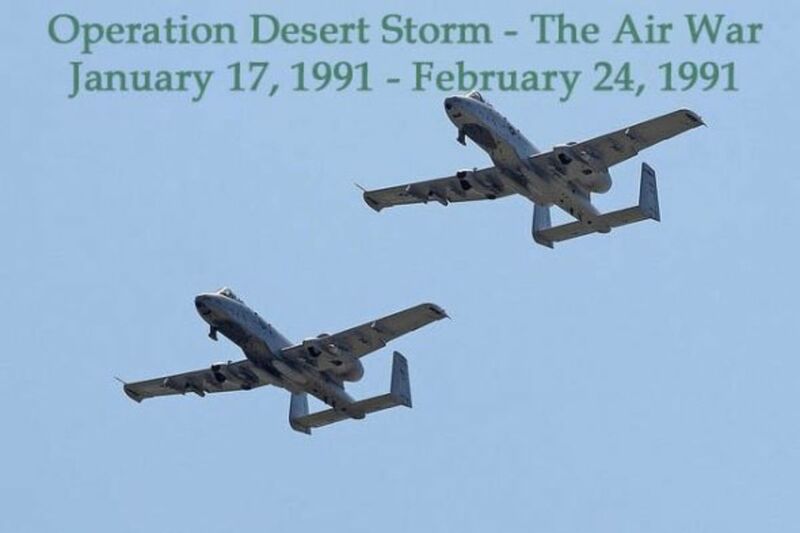 Operation Desert Storm - The Air War - As the People Saw it and Some They May Not Have Seen! 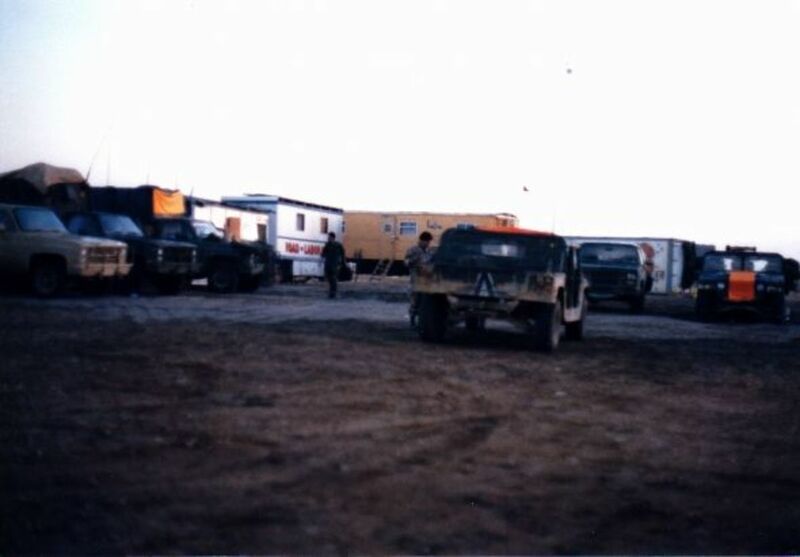 A few days after the Air War began, we started "bugging out" and headed towards the Iraqi border at Log Base Willow, Castle Hill. 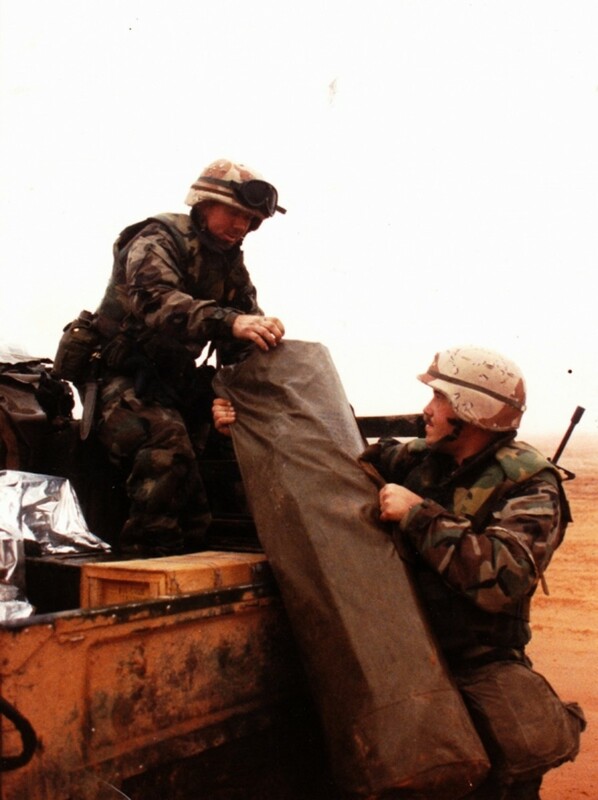 In this photo, I am loading up a truck and handing a bag to one of my troops in the truck. Notice that we are not in full desert camouflage yet. We had to wait for our issue and due to demand, we didn't get a full set immediately. 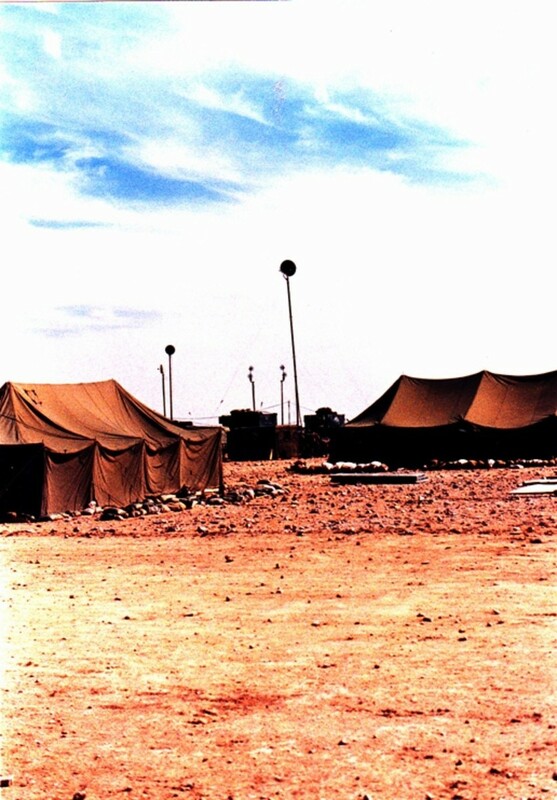 This was our final base camp in Saudi Arabia and we stayed here for several weeks until the Ground War began. This location was only one mile from Iraq. At this location, the fires and smoke in Kuwait, set by Sadaam Hussein were visible and we could also smell them. We could also hear the air attacks on the Iraqi forces and every once in a while, we would see a SCUD missile flying in. This was our base camp at Log Base Willow- Castle Hill. The road near us was filled with little white trucks, mostly Toyotas and were packed highly with possessions. Most of the Saudis were evacuating due to impending attack from Iraq and during any hostilities, they didn't want to be around. This was a desolate place and was truly barren. It got so cold in the morning that there was ice outside. In the afternoon, it reached temperatures over 100F. 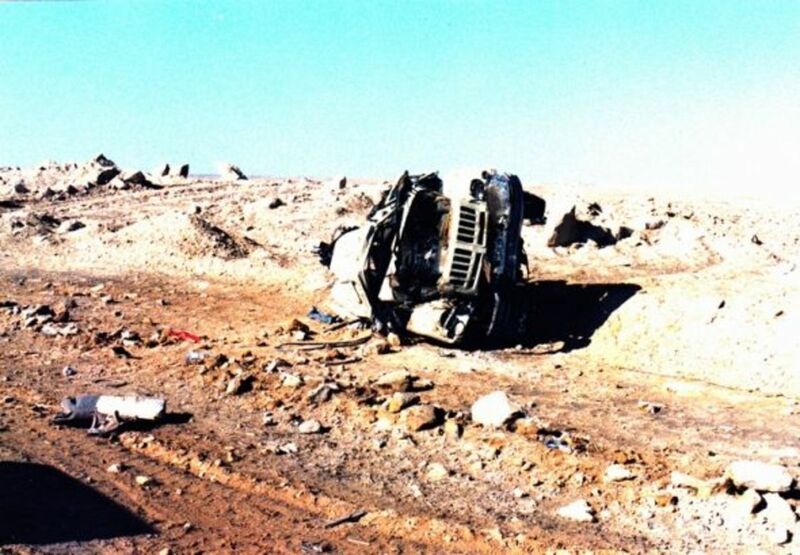 We drove to Riyadh for a reconnaissance mission during the stay at Willow and during that time, an Iraqi Scud Missile was launched in our direction. As you can see, the SCUD was hit by one Patriot Missile and the other Patriot missed it. 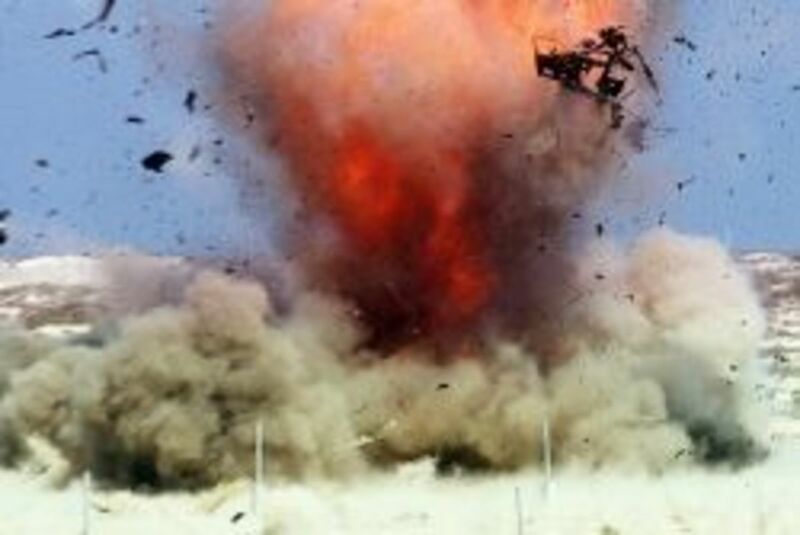 This strike did not detonate the warhead and it fell in a school parking lot, killing a Saudi janitor. This thing came so close to us that it really frightened me more than I had been since I had arrived. Seeing this made you realize that all of this was real. 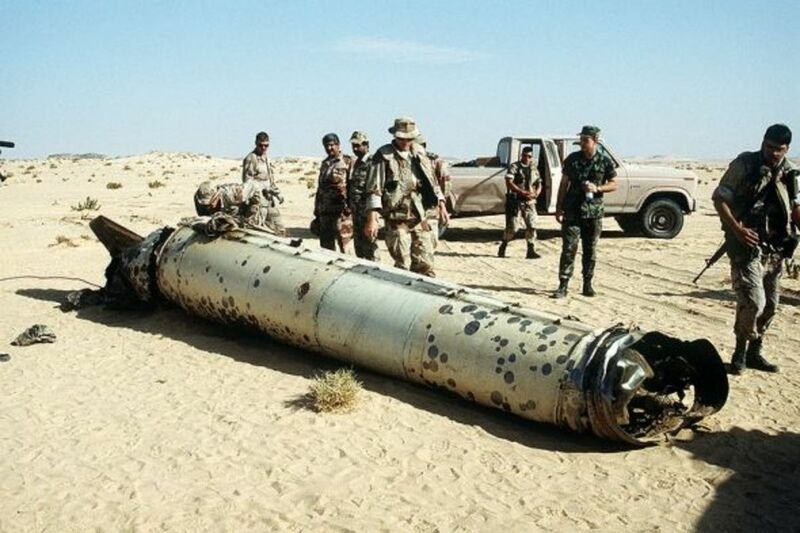 This is a photo of an Iraqi SCUD missile downed by a Patriot Missile. The Coalition Forces used cardboard tanks to disguise actual tank positions. We used space heaters in these tents and also had to go to the bathroom out in the desert. Nothing scarier than a completely dark night and you out there doing your business. The Iraqis unsuccessfully tried to used radio propaganda and the character "Baghdad Betty" against the American forces in a way that the Germans used "Axis Sally", the Japanese used "Tokyo Rose" (Both during World War II), and the Vietnamese used "Hanoi Hannah" during the Vietnam War. 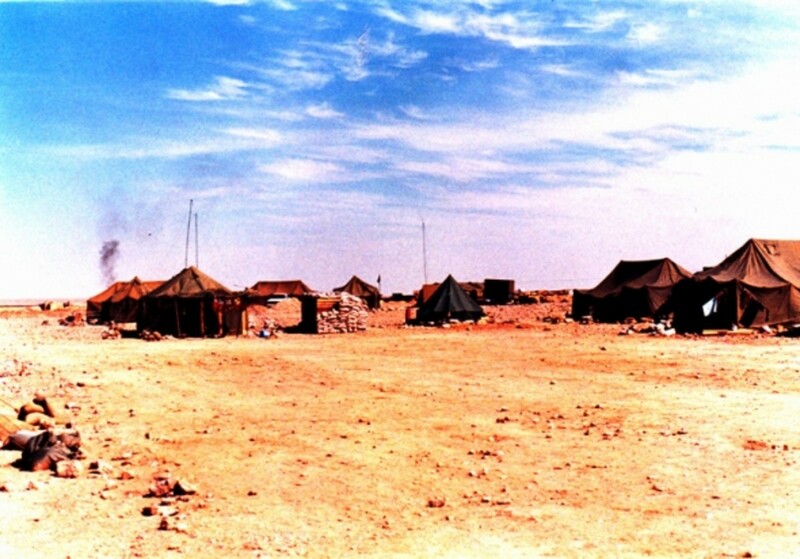 Shortly after the Ground War began, we moved to our base camp in Iraq near Jalibah, Iraq. One mile into the trip was the Iraq border. This photos shows the Iraq border and the dirt berm that was built by Sadaam Hussein's troops as a defensive wall. On the other side of this berm were positions that were used by Iraqi troops. 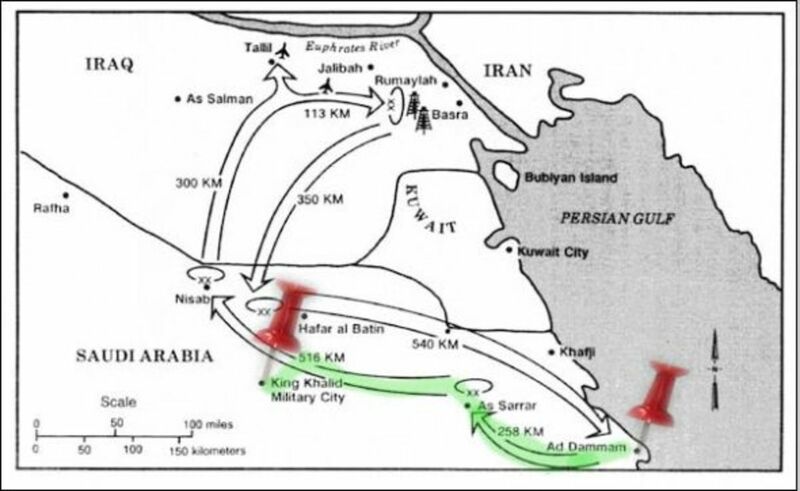 It is interesting to note that this berm extended all the way to Kuwait and in some positions, Iraq put captured Kuwaiti citizens into them to fight against the coalition forces and kept them in at gunpoint. 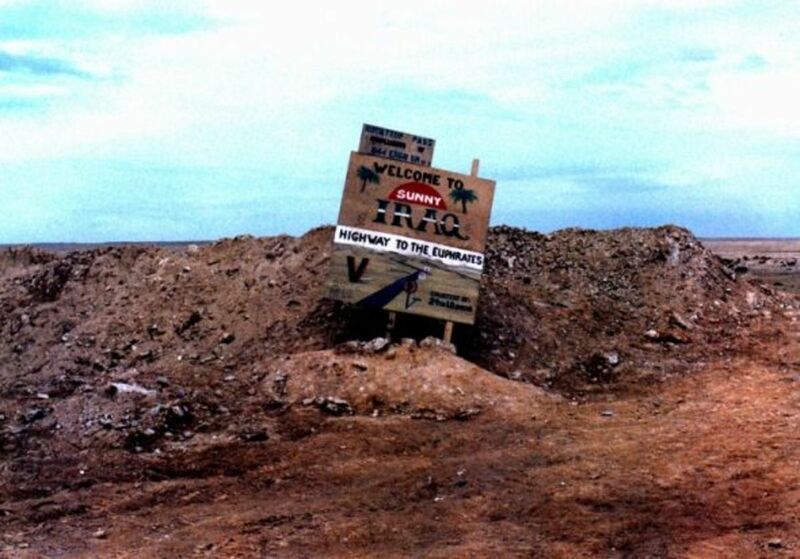 This sign was constructed by V-Corps 24th Infantry Division and erected after plowing through the berm. I was driving my 5/4 ton pickup truck and took this shot. 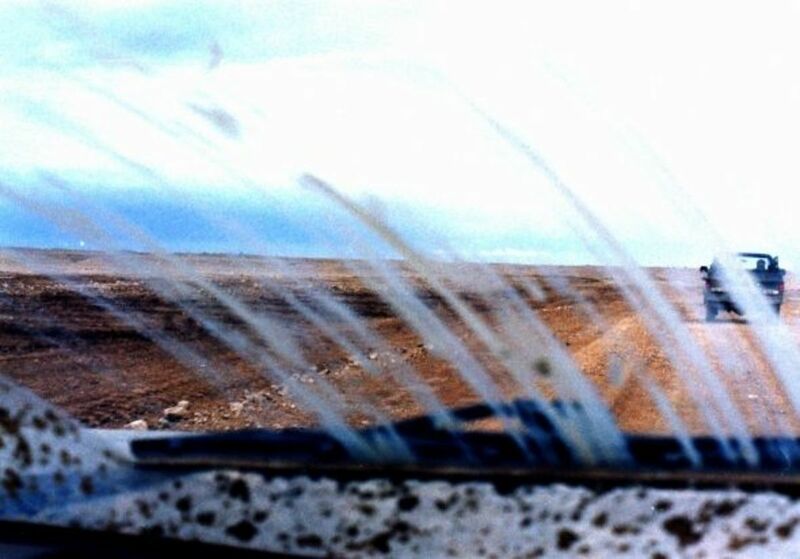 Looks like I could use a car wash, huh? I am driving North, last vehicle in a convoy. If you look ahead to the left, you can see the smoke near As Salman airfield and beyond near the Euphrates River. My truck broke down several miles in and I had to abandon it. It was a little unnerving sitting there all by myself with nobody noticing and to the left, you could hear the Multiple Launch Rocket Systems (MLRS) going off in succession. If you think I look a little scared, you can imagine why. 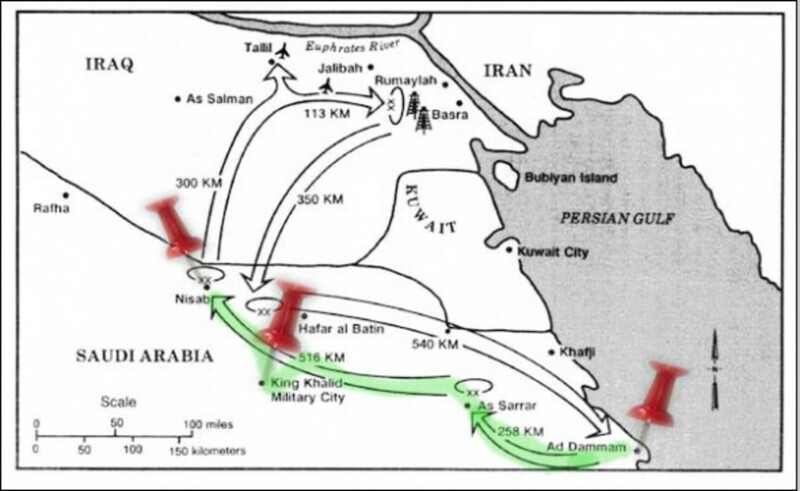 At the request of the US government; many nations sent token forces to the Gulf region. The primary combatants were the US, Britain, Canada, France, and Saudi Arabia (the host nation for US forces). Another shot of the Iraq. We used abandoned buildings, most already riddled by bullet holes. Nothing is eerier than seeing a beautiful sunset and hearing gunfire. To this day, I still get a little cold chill at sunset. You could pretty much pick up any type of abandoned equipment that you wanted. This was hooked to the back of our trucks and pulled along with us. A lot of abandoned equipment along the roads. You had to be careful because some of it was booby-trapped. I got several uniforms and other small items. 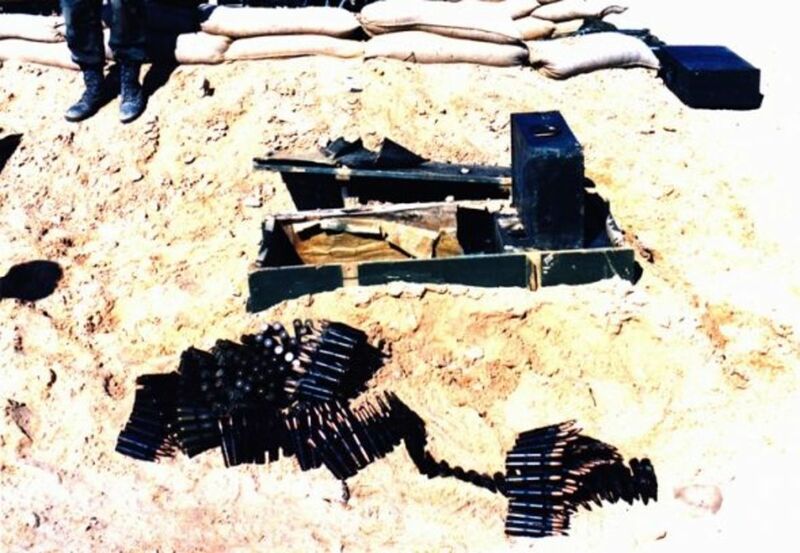 This was a box of ammo near an abandoned foxhole. It had chemical rounds in it that were never deployed. It is interesting to note that the Iraqis lived in their foxholes. They were covered with lice & sores and didn't even leave to go to the bathroom. Their excrement was right in there with them. They had little piles of rice around the rim of the foxhole, each one was a meal or a partial meal. Many of them were held in the foxhole by gunpoint under fear that they would get shot if they abandoned it. I found a full box of detergent in one foxhole, I don't think they had the water supply to use it. The coalition thought it would be easy to get Iraqi soldiers to surrender because of the conditions in which they lived, however, it was common for an Iraqi to live this way and it wasn't as bad to them as it was to us. 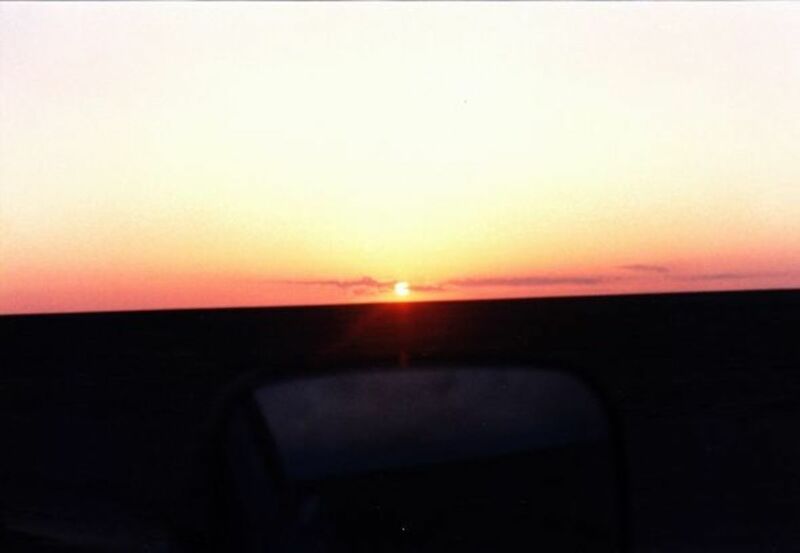 Photo taken close to Jalibah, Iraq. There were more things that I just couldn't stomach and would never take a photo of...but many did anyway. Doesn't Seem Like 21 Years, Huh? - Please Let Me Know What You Think. Good read. I served with C co. 3/15 Inf. 24th ID and fought at Jalibah Airfield, so we sure as hell chewed the same dirt. I remember the welcome sign as well and it is enshrined at the National Infantry museum at Ft. Benning now. The only thing is you have the 24th ID as V Corp, we was part of XVIII Airborne Corp. No bigger, just something that caught my eye. 25 years ago now...time flies doesnt it. VICTORY! I wouldn't say I "enjoyed" it, but I thank you deeply for your service. It was a good insight into what it was like. Our youngest went there right after Saddam was deposed. He had two tours there. The first one was reasonably good; they were in the area where Petraeus was in command. The second time wasn't nearly as good. He brought back a lot of photos from the first tour. This is a great lens that shows things just as they were. Well done. @djohnjulio: I was in HHC, we were over your unit. Nice web site. I also served in Desert Storm Desert Shield. I was with the 20th Engr. Bn. out of Ft. Campbell. We were to the west of your sites. We ended up wearing the 20th Engr. Bde Patch. Thank you for what you and 1,000's of others have done in the name of freedom. Excellent pictures and memories. Very heart wrenching to remember. Just want to let you know that I am back for another blessing on this lens.. so close to my heart,.. and voted my favorite lens of the year. Thanks! Terry V Thank You for your Service!!!!! I saw a comment you left on a "The 11th Day of Christmas Celebration:" and I replied...Thank You for that comment! My husband is a Vietnam Vet and very much involved in Veteran organizations, he also has a Bronze Star(V) and Purple Heart...I will be making a lens for him, his website server got shutdown. I have included this article as a featured lens on my 'The Yom Kippur War' lens. Thank you for telling your story. Great lens. Thanks for your service and sharing. Where does time go? Fantastic Lens, i was part of 7th Armoured Brigade (Desert Rats), thanks for the memories. My Lens is https://hubpages.com/education/the-queens-royal-ir... , be nice to see you there, kind regards, Rob. Been here before, but thought I would make a return visit. Thanks again for your service. GREAT Lens!!! When I saw the title I knew I had to check this out, I was there in the gulf for shield and storm on board an ammo ship. Brought back lots of memories, Thank you for sharing and Thank You for your service. Very nice account of what happened. I remember what we heard on the news, it was pretty awful what was happening over there. Happy Veterans Day, thank you for your service. On Veteran Day I come back to give Blessings! This is a special lens as it is based on personal experience. I was on the ground there with the 24 th id. 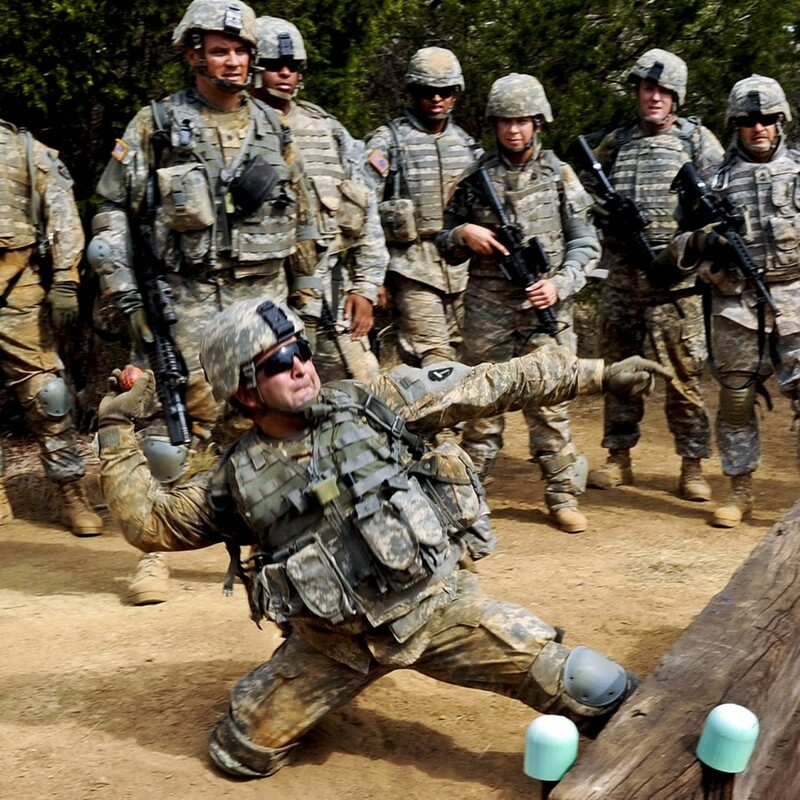 Happy Thanksgiving to all service members retired and active especially to these overseas in combat zones be safe. I can still remember all this happening and having my students write letters to the soldiers. Thank you for your service, and I'll pray you come to enjoy the sunsets as God intended without it being a "war" memory. A great first hand account of the war events. Remember, have seen pictures of war on television. I had just gotten married in Fort Stewart, Ga. three days before my husband's deployment. It was the most difficult time in my life, in all of our lives, filled with so much fear. It will never be forgotten. This is a great lens! This is an Excellent lens! Thank you so much for sharing this, the interesting photos, your pic--and yeah, NO you don't look like Hitler at all, hahaha :) I salute to all the Veterans, and you did an awesome job! Proud of ya! God bless you! Wow. I remember this. Every night we would come home from school and switch on CNN and listen to Wolf Blitzer reporting news from there. Thank you for your service. The little known facts were great. I loved the dumpster bin and cardboard ones. Thank you for liking my lens "Surprisingly Unexpected Disasters" and blessing it. Very nice site. I have a question. I'm trying to get confirmation from someone who was there. 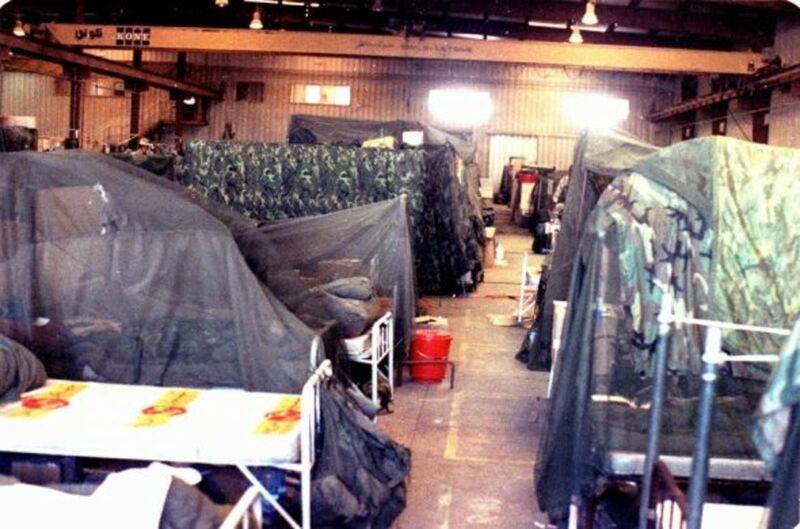 During Operation Desert Storm, did the base camps have a place to zero your weapons, and if so was the zero in yards or meters? A great article. I especially like all the personal photos, and your first-hand account! Thank you so much for your service. Blessed, and added to "Best Military &amp; Patriotic Pages"
Having endured this war with a gas mask in a box over my shoulder and occasional sojourns in the sealed room (Israel), I was fascinated to read about if from your perspective. P.S. Thanks for blessing my Joel Osteen lens. I featured you on that lens for blessing it. Thank you. God bless! Thank you for your dedicated services to the USA. And congratulations on your Bronze Star Medal. Thank you for sharing your experiences. My heart and prayers go out to all our troops throughout the world. I pray all of our men and women are brought home safely very, very soon! God Bless the USA! Great Lens. Thanks for reminding everyone of the reality of war. It's never what people imagine. 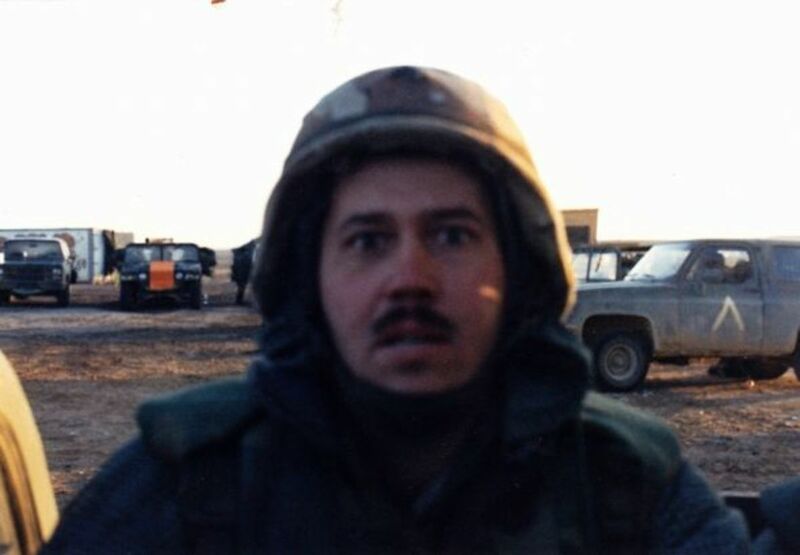 I've started my own lens about my experience in the Gulf War. It's still a work in progress, but it will tell what happened in my little corner of the Gulf War. Thank you for your service. My father was also served in the gulf war. 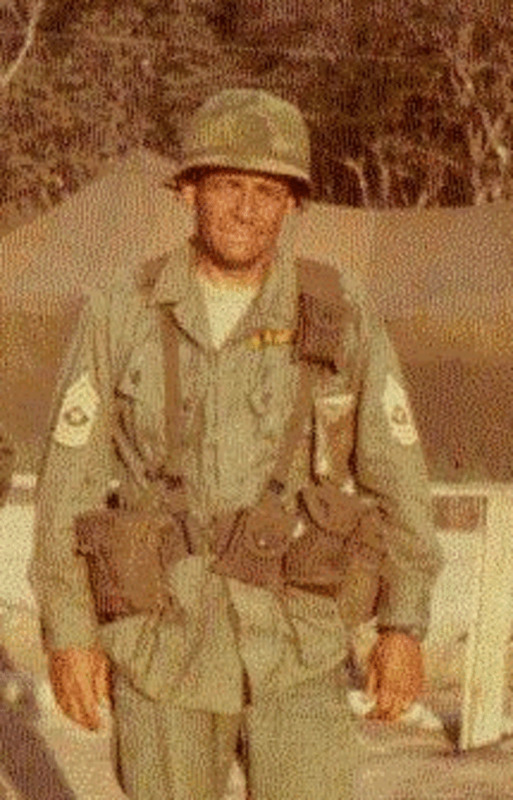 He was a combat engineer that guided bombs with a laser. Great lens. Thank you. It certainly does not seem like 21 years. Bless you. Awesome lens. A lot of us worked hard to support you all there -- you did us proud. Thanks! @anonymous: No matter where you go or what you do, you always find someone that knows you! hahaha! @miaponzo: Thank you. I am blessed to have friends like you! 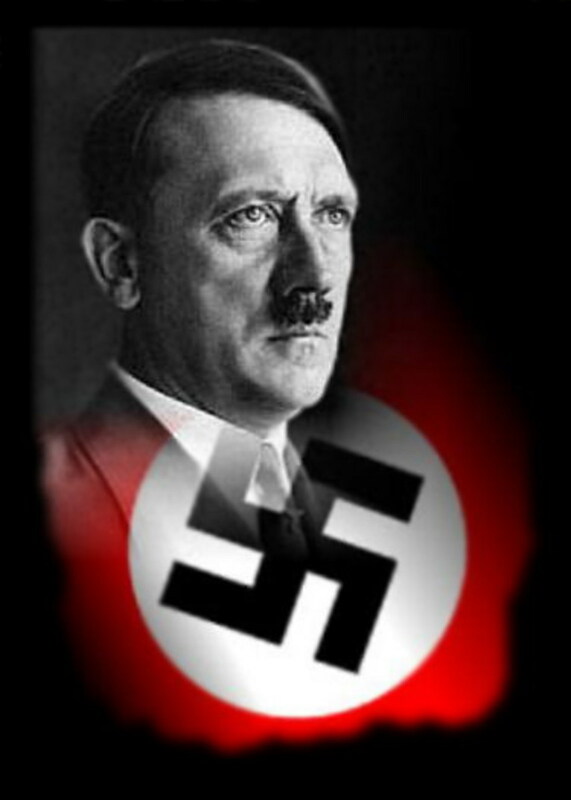 I think the author of this page DOES look like Hitler. I bet in Germany he hung out in the Gestapo HQ. , and plotted chaos with one of the finest the NCO's, that the Army has ever produced. I am thankful, and proud that he did. BTW, stop shammin' with that slacker 84B, and get down to the motor pool. ASAP. I'm back to read this again.. I hate crying but nevertheless that is what I do here. I remember Desert Storm. 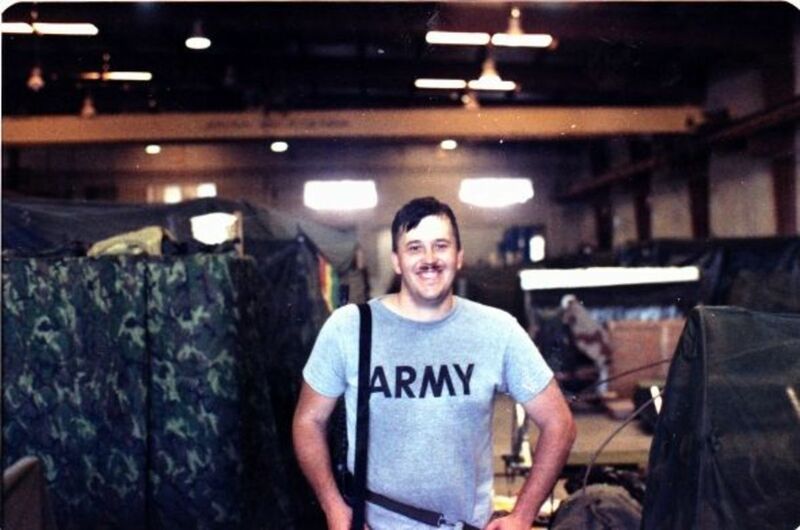 My husband, at the time, had just ETSed from the army at Fort Riley. We had 2 little ones under the age of 2 years. I was grateful that he didn't go, but it bothered him a lot. My aunt was in Kuwait during the war and they went to Bahrain together with her boss before the ground war. Thank you for being there &amp; for sharing this. 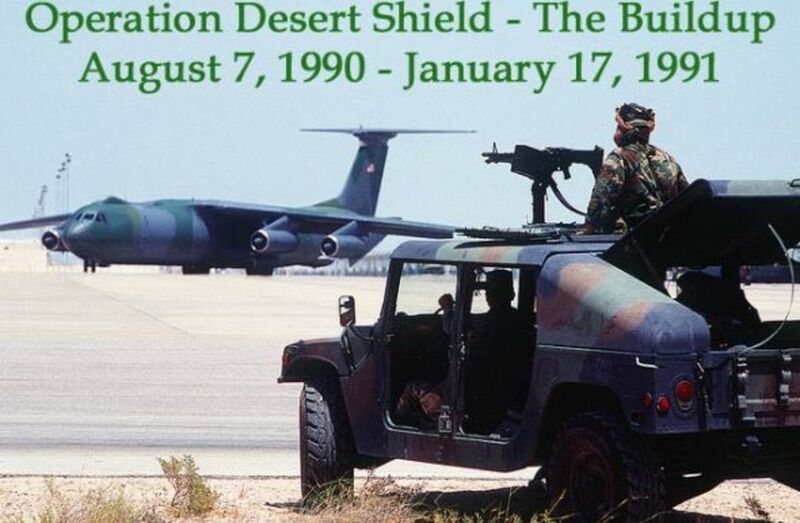 I remember Operation Desert Shield unfolding as I was home on a break from my first year at college. Hard to believe it's been 20 years. Thanks for sharing your experiences. This is definitely a side of the story most of America never saw! Great ride in the Way-Back machine. Was looking for some stock photos to "fill in the blanks" You got a lot more than that here. well done. C'mon over and add to our new site. No it doesn't. The lens brought back a memories. Great share. Ft. Dix, NJ in Dec. of '87 and had my AIT there then was sent to HI for PDS(permanent Duty Station). Then I got out and then was reactivated in 1991 to go to Desert Storm. I was in Ryhaad, Saudi Arabia. I wrote a story about it but I have some other information that you might be interested in knowing. Yes, lets keep in touch. E-mail me please. Great Lens! Hello fellow Veteran, love the lens. I was with the British 7th Armoured Brigade (The Desert Rats). Never forgotten our experiences even to this day, but i keep keeping strong, no regrets at freeing a nation. Again, great lens. In a way, it seems like yesterday. May I please say, "Bless you, Sir." Though I had previously not paid ann inordinate amount of attention to the goings on of war and military things, when this, the first real "live on TV" war came to be, I woke up... rushed home from work every day, tuned in and was glued to the television until bedtime. Suddenly it was real, not just something from history books. But, you - YOU were there, along with so many other brave ones. Thank you for showing us some things we didn't even see on TV ... and for making me smile with your comment about the cute nurses! Thanks again for visiting my lenses. I was actually sitting in a TCBY place in Memphis eating yogurt on a date when they announced that we were going to war. I will never for get that. I just can't imagine how it feels to be on that journey. As I look into the photos, it's scary but this is something interesting and challenging journey. Thanks for sharing! "Thank you" is not nearly adequate for the expression of gratitude that I have for this lens. Two of my close friends died in that war, but I believe it's the survivors who were is the blood &amp; guts with them that honor them best! Thank you, and it was an honor to digest &amp; share this lens. Congrats on lens of the day brother. Wow your really set this post out well, I love the way that you inserted the images, particularly of the helicopters that one moment you see it and the next you don't. Thank you for sharing with us all, I looked at your living quarters, you certainly don't get to live in luxury. I think that we never really think about the hardships that soldiers face, you go from comfortable to very uncomfortable in order to fight for your country. Thank you for your service to our country. God bless! Congratulations. Thank you to all the soldiers for keeping us safe. God bless you all. Congrats on LotD! You are appreciated! Thanks for sharing your experience. War sometimes seems abstract to those of us who are not in the middle of the action. Your photos and memories make it so much more real. Very interesting lens, you was there... and all is as authentic as can be. Incredible pictures. What you have shared with us is a true gift. Thank you. My brother-in -law was in Operation Desert Storm as a marine. This lens is interesting, and nope, it really doesn't seem like 20 years. Thank you for putting this together. It isn't easy living through war, but you are a hero and have an obligation to the world to live on. Have you ever hear of Veteran's Administration benefits? You've got a lot and sometimes the frightening parts of war grips with an iron fist. I don't know why it is that the horror of life grips and the happiness events of life isn't as strong to sustain you. It is best to live no matter what. I'm surviving being a victim of info and name theft and it is only something I rarely think about and guess who brings you back to it all the time the victimizers who are insane anyway, so hold on to the happy part of life okay? Live on and know that you have lots of things to look forward to. Take care. Happy Holidays! 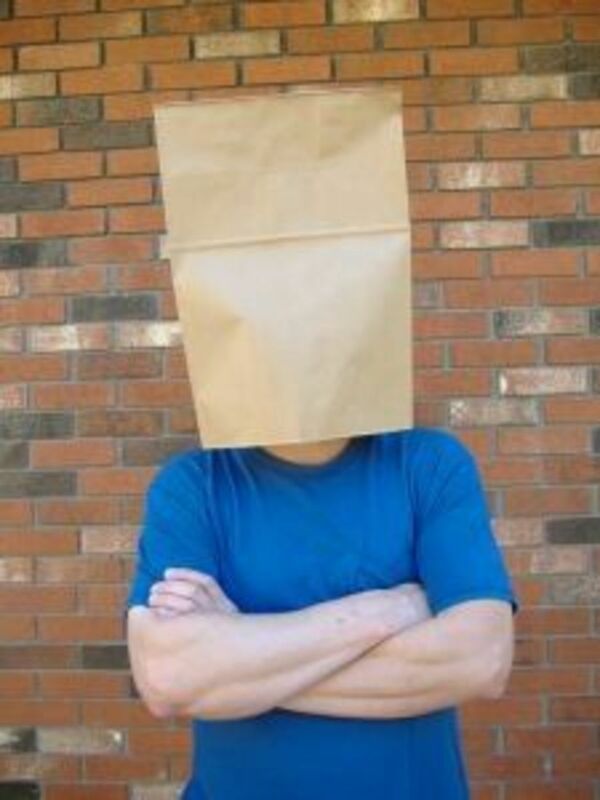 Well done Terry.Was sure this was LOTD material and now it is featured on Squidoo LOTD Lenses. Hugs. Congratulations on LOTD. I'm an Army veteran, have a daughter in the Army in Afghanistan, a Marine grandson also there, a granddaughter who is a Navy Lieutenant, another daughter who is ex-Army, so as you can tell, we believe in the military. Thank you for your service in a horrific place and time, and I enjoyed reading your story. Blessed by a SquidAngel. You get all the Honor you Deserve, young man. Thank you for clearing my eyes with tears. My hope and prayers for you are to live a full and peaceful life, after the war is over. My brother was in the Viet Nam War. We emotionally lost him, forever, he is paranoid, schitzophrenic now. I, haven't seen him in year, and when I do, he is very scary and un-medicated. I'll Twitter your link out as a gesture of respect and hopefulness, my friend. PEACE! Congrats on your LOTD, and much deserved. I'd like to join with everyone else in saying THANKS to you for your service along with all of the others that proudly serve or have served their country. Thank you for your service to our country. God bless every one of our brave soldiers. You have a gift for storytelling, and hopefully the generation behind yours will take heed. Congratulations on LOTD. 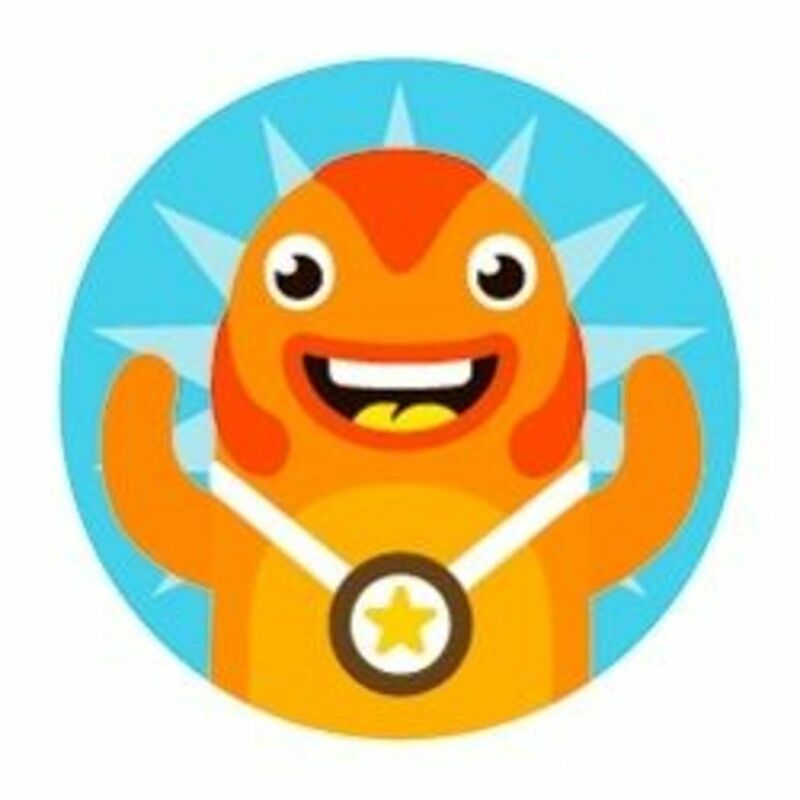 First of all, I would like to thank you for your service. 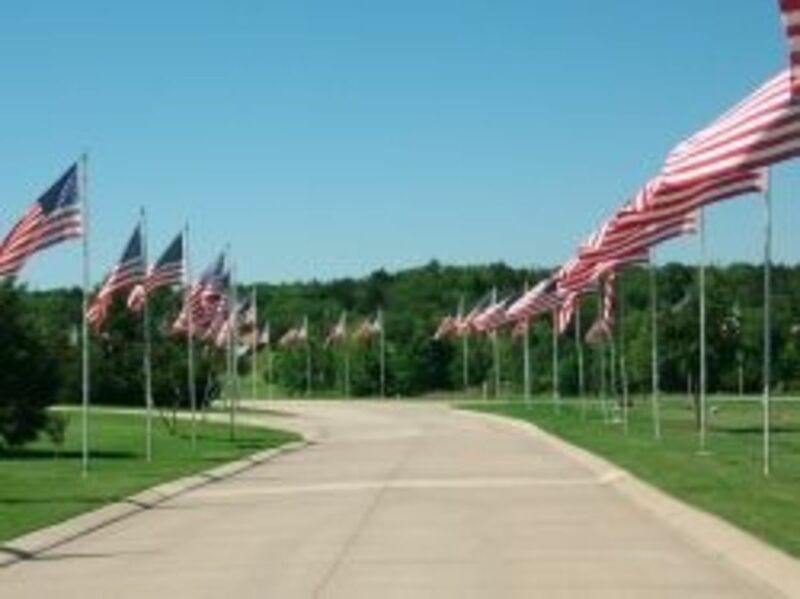 It is the greatest honor to read about it here on Squidoo. Second, congrats on lens of the day. You deserve it! What a wonderful lens...so informative and interesting. Thank you also thank you for your service. Blessed by a Squidangel. This is a very enjoyable lens. I learned a lot from it. I remember desert storm. I was 8 years old and the news footage of it really captured my attention. I made a little book for school about the war. I had a cousin who was fighting in the war. Congratulations on a much deserved lens of the day. Now I know a bit more "behind the scenes" info. Congrats on LOTD! Well deserved. It truly is hard to believe that its been two decades. Thanks for your service to our country. 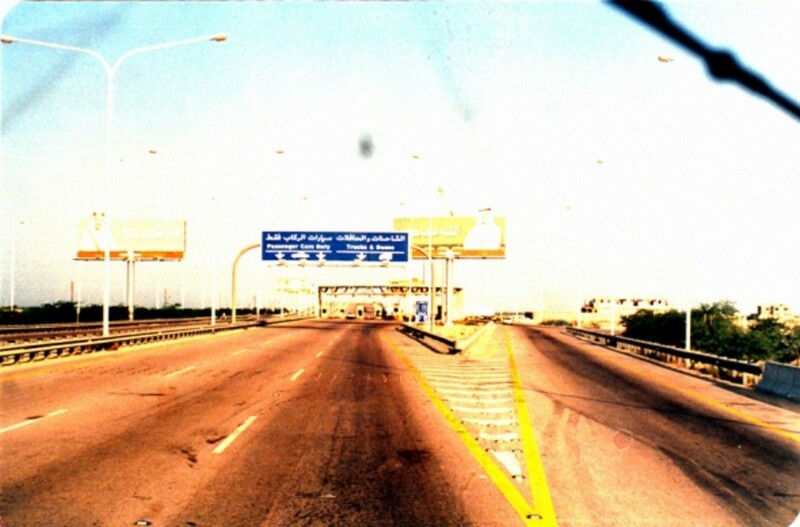 I was in Kuwait when Iraq invaded and stayed until the US embassy evacuated us.. I was 3 months pregnant at the time, and walked around day and night with a clandestine gun strapped to my calf... we lived day and night with the sound of rounds of machine gun fire and fantasized about what we would do if any Iraqis knocked on our door (ie.. shooting incessantly at them with our weapons until they would all be dead)... HUH??? Strange what certain situations make you think. ... survival is strange.. thanks! and Blessed! My husband served over there, he was in the USMC. @GeorgeneMBramlage: That would be a Bronze Star for Valor. Purple Hearts are for being wounded by enemy action. I am glad you have a great heart Cercis. I too am grateful for his and every Man and Woman who have served the United States of America and helping pursue happiness and our FREEDOM! Excellent lens. Hard to believe it was 20 years ago. I followed the build-up, air and ground phases very closely and with great interest on TV. Thanks for your service, Sarge! And Congratulations on being chosen as LotD! OH and congrats on your LOTD and Purple Star...both very much deserved. No, it certainly does not seem like 20 years! Thank you so much for sharing such a well thought out and constructed lens. Many, many thanks for serving...glad to have you back in OH again. Fellow ex-buckeye. I remember where I was when I heard that we were going to war. Thank you for serving and congrats on being Lens of the Day. no, it does not seem like 20 years. Congrats on LOTD! Congratulations on LOTD! Very well deserved! Thanks for sharing! I remember watching it on tv my cat was very intrigued when he saw all the lights on the tv screen. One of the best lenses I've ever read. Thank you very much for sharing your story, pictures and experience. 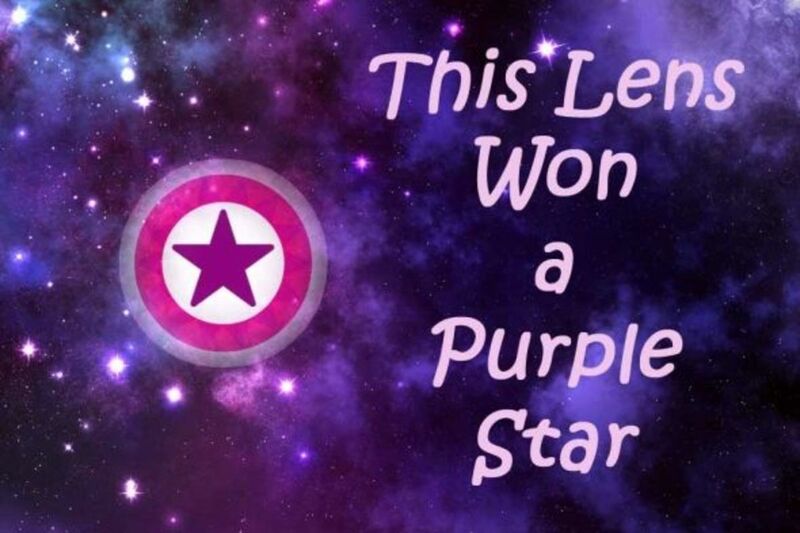 Well deserbved purple star and LOTD honor, you have done an excellent job of showing, and describing this historic military effort.